Every day, your Tank Utility monitor sends a reading to your app. How does that happen? Your propane tank is fitted with a float gauge that can tell how much liquid is inside. The Tank Utility sensor connects to an R3D dial to read the position of the dial needle. 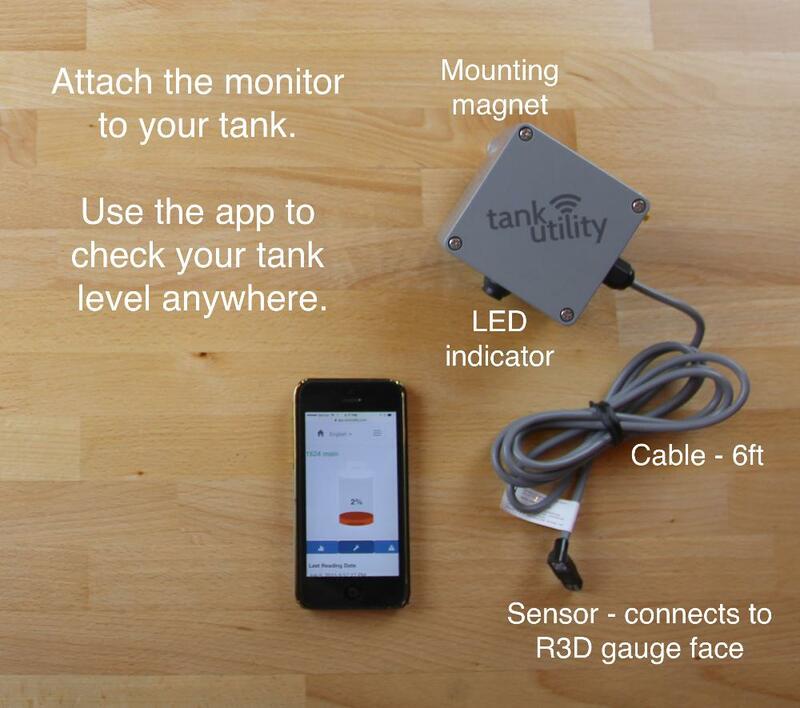 The sensor reads a voltage, and that value is sent to our servers and is shown in your Tank Utility app. Your monitor needs to be connected to your home WiFi network in order to connect with our servers. Your monitor connects to the WiFi at your house to send the voltage measurement to our servers each day. Your device will wake up and transmit a reading once every 24 hours. The voltage measurement is then translated into a tank level percentage based on the configuration of your tank (you can set this by going to the wrench button in your app). We also collect other metrics to make sure your monitor is working properly. The monitor then waits for confirmation that the reading has been sent, and checks if there are any firmware updates to download. When readings are confirmed, your monitor goes back into deep sleep for 24 hours to conserve battery. We store your reading data in our servers so that you can see your tank level anywhere that you can access the internet. When you open the app, you will see the most recent tank levels. You can also plot the last 50 days of readings so that you can understand patterns and trends in your propane usage.